This ladder can have at least 7 different uses and functions. 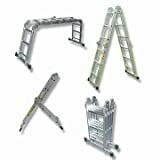 With 3 multi position articulating hinges that allow 18 different configurations, this ladder can be a step ladder, double step ladder, extension ladder, mezzanine ladder, multi-lever ladder, platform scaffold or a stair-step scaffold. Made with high quality aluminum, lightweight and rustfree. With all these features, you won’t need to buy another ladder.